Digital documentation workflows include a range of features such as editing electronic templates as well as e-signing and collecting signed documents. The digital signature has become the go-to way of finalizing agreements in the business world thanks to its ease of use. Users may sign PDF online choosing a number of different online solutions or software programs. Those who do not want to spare time browsing for a separate editing, storage and signature solution should use PDFfiller. It combines numerous editing, signing and document storage features. Thanks to this, forms can be fully processed using a single platform. In addition, the online service works on a range of devices and browsers. You can easily sign a document online on PC or smartphone using the PDFfiller platform. No matter what device you work with, it will look the same on Mac and Windows as well as on any iPhone and Android. Try advanced features designed to make your e-signature look perfect. Begin by uploading a file and opening it in the editor. Insert all necessary information in the sample. Add a signature or initials field to your document. To do that, open the “Add Fillable Fields” tool on the left-side. Select the necessary field and place it on the page. Click on the highlighted signature box. A pop-up window will appear next. Type your full name on the keyboard, your handwritten initials will appear on the screen. It is the easiest way to create a digital signature. Draw your autograph with a mouse or touchpad. It will take a little more time, but the autograph will look natural. Upload a photo of a signature written on paper or capture it with your camera. Draw an autograph with your smartphone’s screen. Opt to use a scan of a QR code or send a link via SMS or email. Finally, your legally binding signature will appear in the cell. Note that the system automatically saves every signature you create and you can reuse them an unlimited number of times. Next time you fill and sign PDF document, you don’t need to create a new signature, but select one of the existing ones and add it to your template. Save a template and download it to your computer or store it in your personal account. One more useful feature you can work with is the signature request. Those who need to collect autographs for their samples can do so via email. The best part is that even unsubscribed users can place their initials in the sample following the link you send them. Once a person signs a document, a notification will be sent to you. 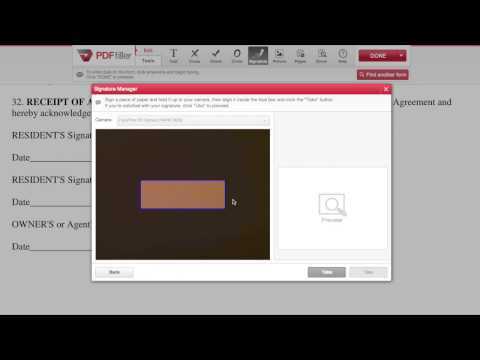 To sign a PDF, upload your document using PDFfiller's uploader. Click the Signature' button and sign your PDF by drawing, typing or uploading signatures. Select and insert the signature to the desired location. To create a field for a signature, click the 'Fillable Fields' tab on the right to create and insert signature fields anywhere in your document. To add a date to your PDF, click the 'Date' button and move the date to the desired location. When you're done with signing, click the 'Done' button and email, print or save your document. To get your documents signed and obtain third party signatures, click the 'SendToSign' button and email your documents with signature request. How to Sign a PDF Form Online? 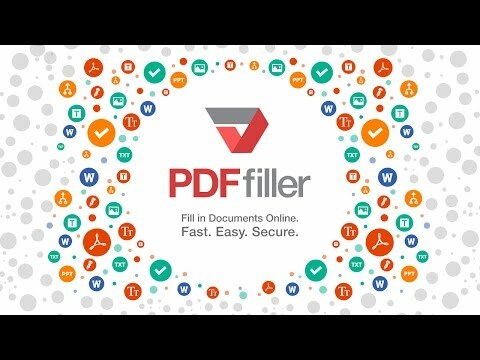 PDFfiller is an online PDF tool which allows you to fill and sign any PDF file from any device anytime. With PDFfiller, you can also search for, edit and e-sign PDF documents online without downloading and installing any software. How to sign a PDF online? To sign a PDF online, upload your form to PDFfiller’s online editor. Click the ‘Signature' button and sign your PDF by drawing, typing or uploading signatures. Select and insert the signature to the desired location. Can I fill in and sign a document online? Of course you can. 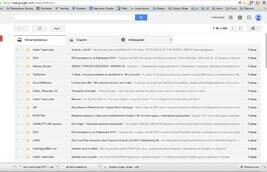 Upload your document to PDFfiller’s online editor. Choose the ‘Text’ button and start typing. You can fill the text anywhere in the document by moving the text box. Click the Signature' button and sign your PDF by drawing, typing or uploading signatures. Select and insert the signature to the desired location. How to get my document signed electronically? To get your permit signed online, upload your document to PDFfiller’s online editor. Edit your document using PDFfiller’s various tools and features. Click the ‘Done’ button after you’re done with editing. Select the ‘SendToSign’ button from the choice menu and select your delivery method. You can create a ‘SendToSign’ request by adding recipients. We’ll send your recipients an email with a direct link to the document, and a copy will appear in current PDFfiller users’ Signature Requested folder. A PDFfiller account is required to access the document, and we’ll create and include login credentials to a free account for recipients that do not already have one. Recipients will be able to sign and return the document for free with PDFfiller. Is my digital signature legal? Yes! The Electronic Signature in Global and National Commerce Act (E-Sign Act) signed into law June, 2000, provides validity for the electronic records and signatures in conducting interstate and foreign commerce. Therefore, your electronic signature is legal when filling and signing any document using PDFfiller online. Read more about the E-Sign Act.